We develop numerical models of marine ecosystems, for example, continental shelf systems of the North American east coast and the open North Atlantic Ocean. By combining these models with observational data sets, we test and improve model predictions which ultimately lead to an improved understanding of these systems. Numerical models are increasingly powerful tools for quantifying the cycling of climatically relevant elements such as carbon and nitrogen and for understanding their role in past and future climatic changes. Such models are also essential for predicting the effects of natural and anthropogenically induced perturbations on coastal ecosystems. 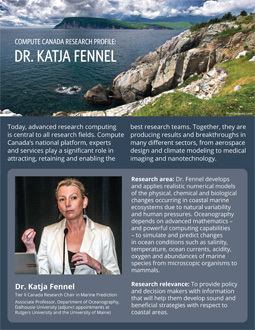 We are affiliated with the Oceanography Department at Dalhousie University and have extensive collaborations with colleagues within Dalhousie and at other Universties, for example, at Dal's Department of Mathematics and Statistics, Rutgers University, U of Maine and Texas A&M. Oppurtunities for undergraduate honours projects and graduate studies exist in our group. Contact katja.fennel@dal.ca if interested. Hypoxia in the Gulf of Mexico Physical-biogeochemical modelling of the Texas-Lousiana Dead Zone.